TraceWrangler is a network capture file toolkit running on Windows (or on Linux, using WINE) that supports PCAP as well as the new PCAPng file format, which is now the standard file format used by Wireshark. 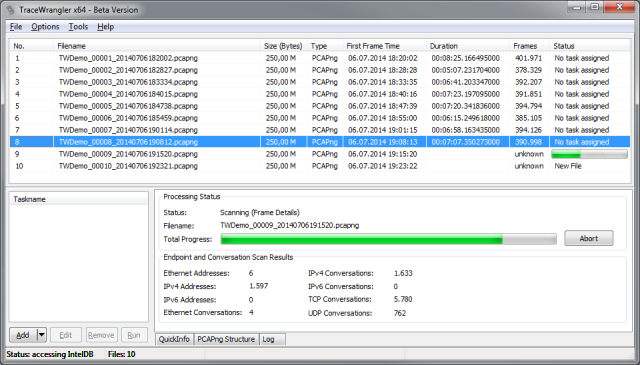 The most prominent use case for TraceWrangler is the easy sanitization and anonymization of PCAP and PCAPng files (sometimes called "trace files", "capture files" or "packet captures"), removing or replacing sensitive data while being easy to use. Sanitization/Anonymization/Scrubbing of packet captures created by Wireshark/TCPDump/etc. There is also a semi-automated build section where you can download current builds. Those builds are usually working better than the latest stable release, but in some cases features may not be implemented completely yet, or still broken. Also, the documentation isn't up to date. Documentation is available online, as well as a Windows help file inside the download container. There also is a PDF File. You can also take a look at my presentation I did about anonymizing network packet trace files at Sharkfest 2013. There is also a video recording of that talk on LoveMyTool. There is a ChangeLog available, listing all the changes for published versions. Updated versions will also be announced via twitter (@packetjay). There is also a RSS feed available. Sent feedback about bugs, feature requests and other topics to "jasper [ät] packet-foo.com". My PGP key is found here. the .task file you used, if you still have it. The maximum trace file size is less than 2GBytes. This limitation is a result of the way the files are read by using Memory Mapped files. I'll work on this "when there is time"tm. Capture files that contain truncated or damaged frames may not work under all circumstances. I recommend using captures that contain full sized frames. Reason for this is that I may have been lazy in some parts of the code where I do sanity checks against the length of the data available for processing, which is a great way to run some pointers into the great beyond. Ouch. IPv6 checksums may not be calculated correctly when extension headers (including fragmentation headers) are used in a frame.